Tredegar House: Pub Signs At Risk? One article from today's newspapers jumped out at me. Louise Gray in The Telegraph writes an interesting piece about traditional swinging signs that hang outside pubs. Since a Royal Act in 1393 made such signs compulsory they have dotted the British landscape and some of them are extraordinary works of public art in their own right. Now they are endangered. "Only around 30 independent pub chains and breweries in Britain are still ordering individually painted signs, amazingly a few of these fine artists are still working and there are some notable examples such as The St Austell Brewery in Cornwall that still employ sign writers," he said. "But it is a shrinking market and the dominance of a few chains has contributed to the disappearance of traditional British pub names, and led to a profusion of bland corporate makeovers." There are quite a few pubs with Tredegar links. 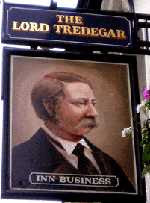 From those quite close to Tredegar House, such as the plethora of Tredegar Arms (although it always used to disturb and slightly amuse me that a print of Godfrey, Viscount Tredegar, and his skye terrier 'Peeps' used to hang near the toilets at the Bassaleg Tredegar Arms. No doubt Godfrey himself would have come up with a dry comment about that! ), Ruperra Arms, and now of course even the Godfrey Morgan run by the Wetherspoons chain. Have you thought of putting together a somewhat comprehensive family tree of all of the important personages in the Morgan line? Or does such a tree already exist somewhere? I would be grateful to learn how many wives Sir Charles Gould Morgan (1760-1846) had. I have read that he was married to Mary Margaret Stoney (d 24/03/1808) but was he married to anyone else besides and if so, how many children did he have? Two different sources point to a second romantic attachment for Sir Charles Morgan. One even claims a discreet second marriage with offspring. I'll try to explore this more when we reach Sir Charles in my Morgan history. The next part of which (Miles Morgan) will appear this week.